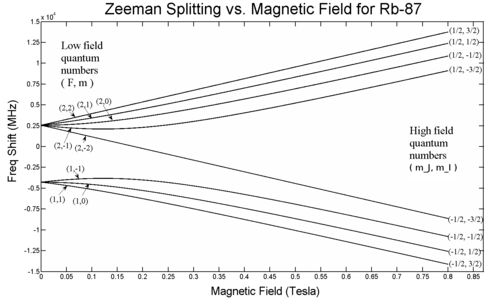 The Zeeman effect (/ˈzeɪmən/; Dutch pronunciation: [ˈzeːmɑn]), named after the Dutch physicist Pieter Zeeman, is the effect of splitting a spectral line into several components in the presence of a static magnetic field. It is analogous to the Stark effect, the splitting of a spectral line into several components in the presence of an electric field. Also similar to the Stark effect, transitions between different components have, in general, different intensities, with some being entirely forbidden (in the dipole approximation), as governed by the selection rules. Since the distance between the Zeeman sub-levels is a function of the magnetic field, this effect can be used to measure the magnetic field, e.g. that of the Sun and other stars or in laboratory plasmas. The Zeeman effect is very important in applications such as nuclear magnetic resonance spectroscopy, electron spin resonance spectroscopy, magnetic resonance imaging (MRI) and Mössbauer spectroscopy. It may also be utilized to improve accuracy in atomic absorption spectroscopy. A theory about the magnetic sense of birds assumes that a protein in the retina is changed due to the Zeeman effect. Historically, one distinguishes between the normal and an anomalous Zeeman effect (discovered by Thomas Preston in Dublin, Ireland ). The anomalous effect appears on transitions where the net spin of the electrons is an odd half-integer, so that the number of Zeeman sub-levels is even. 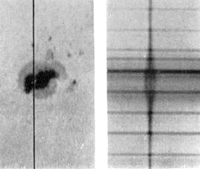 It was called "anomalous" because the electron spin had not yet been discovered, and so there was no good explanation for it at the time that Zeeman observed the effect. where and are the total orbital momentum and spin of the atom, and averaging is done over a state with a given value of the total angular momentum. If the interaction term is small (less than the fine structure), it can be treated as a perturbation; this is the Zeeman effect proper. In the Paschen-Back effect, described below, exceeds the LS coupling significantly (but is still small compared to ). In ultrastrong magnetic fields, the magnetic-field interaction may exceed , in which case the atom can no longer exist in its normal meaning, and one talks about Landau levels instead. There are, of course, intermediate cases which are more complex than these limit cases. The Paschen-Back effect is the splitting of atomic energy levels in the presence of a strong magnetic field. This occurs when an external magnetic field is sufficiently large to disrupt the coupling between orbital ( ) and spin ( ) angular momenta. This effect is the strong-field limit of the Zeeman effect. When , the two effects are equivalent. The effect was named after the German physicists Friedrich Paschen and Ernst E. A. Back. The above may be read as implying that the LS-coupling is completely broken by the external field. However and are still "good" quantum numbers. Together with the selection rules for an electric dipole transition, i.e., this allows to ignore the spin degree of freedom altogether. As a result, only three spectral lines will be visible, corresponding to the selection rule. The splitting is independent of the unperturbed energies and electronic configurations of the levels being considered. 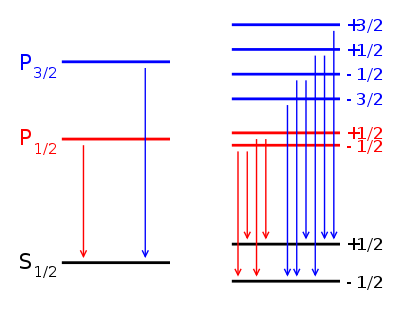 It should be noted that in general (if ), these three components are actually groups of several transitions each, due to the residual spin-orbit coupling. As discussed, in the case of weak magnetic fields, the Zeeman interaction can be treated as a perturbation to the basis. In the high field regime, the magnetic field becomes so large that the Zeeman effect will dominate, and we must use a more complete basis of or just since and will be constant within a given level. To get the complete picture, including intermediate field strengths, we must consider eigenstates which are superpositions of the and basis states. For , the Hamiltonian can be solved analytically, resulting in the Breit-Rabi formula. Notably, the electric quadrupole interaction is zero for ( ), so this formula is fairly accurate. ↑ Paschen, F., Back, E.: Liniengruppen magnetisch vervollständigt. Physica 1, 261–273 (1921). ↑ Griffiths, David J. (2004). Introduction to Quantum Mechanics (2nd ed.). Prentice Hall. p. 247. ISBN 0-13-111892-7. OCLC 40251748. ↑ Woodgate, Elementary Atomic Structure, section 9. ↑ first appeared in G. Breit and I. Rabi, Phys. Rev. 38, 2082 (1931). Forman, Paul (1970). "Alfred Landé and the anomalous Zeeman Effect, 1919-1921". Historical Studies in the Physical Sciences. 2: 153–261. doi:10.2307/27757307.